Traction inverters are used for the conversion of supplied energy, which is then used to drive motors in the most efficient way. In this report, we have considered the traction inverters installed in electric vehicles and rails, forklifts and golf carts. Industrial traction inverters have not been considered under the scope of research. Since the last couple of years, traction inverters are being used in most of the electric vehicles as they are one of the most important components of the electric propulsion system. The global traction inverter report is segmented on the basis of vehicle type, technology, sales channel and regions. The need for a higher level of integration in automotive and transport industries is growing day by day. The concept of electro-mobility and an electrical machine combined with all the power electronics required for a traction inverter is attractive when it comes to sensitive factors such as weight restrictions and system costs. Nowadays, most electrified vehicles including locomotive, trams and metros, contain semiconductor modules of SiC (silicon carbide) and Si-IGBTs. The evolving trend of mechatronics to integrate electric components of a vehicle and mechanical parts and assemblies requires modules such as semiconductors with a high level of power density. Thus, semiconductor is the only molded packaged technological solution for this ongoing demand to achieve high-performance and cost-effective solutions. In the traction inverter market, manufacturers such as BorgWarner Inc., Delphi Technologies, Siemens AG, Mitsubishi Electric Corporation, ABB and Toshiba Corporation, among others are some of the prominent players. These manufacturers are keenly focused on joint ventures with small-scale players to create a strong customer base across the globe so as to gain a higher market share in the traction inverter business. Moreover, these players are also opening new traction inverter manufacturing facilities in developing countries. Furthermore, most of the companies are introducing innovative products to sustain in the traction inverter market as this strategy helps companies to grow their business in the traction inverter segment in the global market. By introducing new categories of traction inverters, businesses can target previously untapped customer markets and gain modest traction in the traction inverter market. In September 2017, Delphi Automotive PLC divided its business into two companies: Aptiv PLC for Mobility Business & Delphi Technologies for Powertrain Business in Massachusetts, U.S. 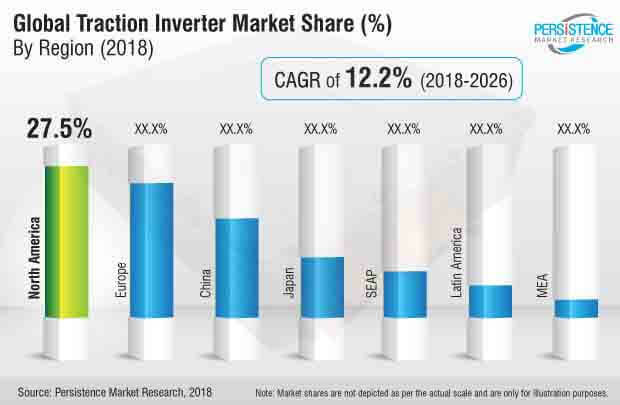 The traction inverter market is a highly consolidated one, owing to the presence of several tier 1 & 2 players in the traction inverter market. The leading players have high presence across the globe. Tier-1 players are projected to account for a substantial share in the global market and are also projected to generate more revenue in the traction inverter market. Some of players hold more than 50% of the overseas business in traction inverter market across the globe. These factors are projected to positively impact the global traction inverter market during the forecast period. We also conducted primary interviews with traction inverter manufacturers, suppliers and experts who have vast experience in the Traction Inverter market. Then interpreted the data collected from various sources and made a perfect frame model for automotive vehicle production and vehicle fleet. Some of the market participants identified across the traction inverter market include BorgWarner Inc., Delphi Technologies, Siemens AG, Mitsubishi Electric Corporation, ABB, Toshiba Corporation, Hitachi, Ltd., Voith GMbh, Infineon Technologies AG, Curtiss-Wright, TM4 Inc. and Prodrive Technologies, among others.